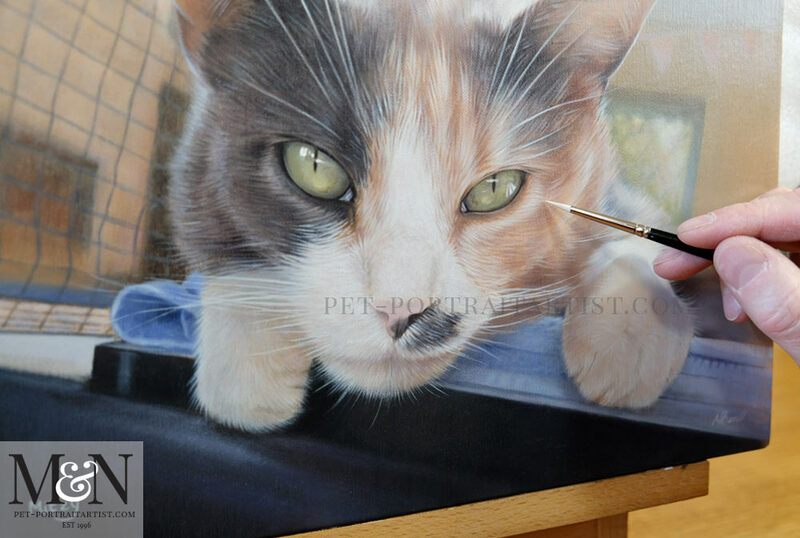 Welcome to our latest Cat Oil Portrait of Mitzy. 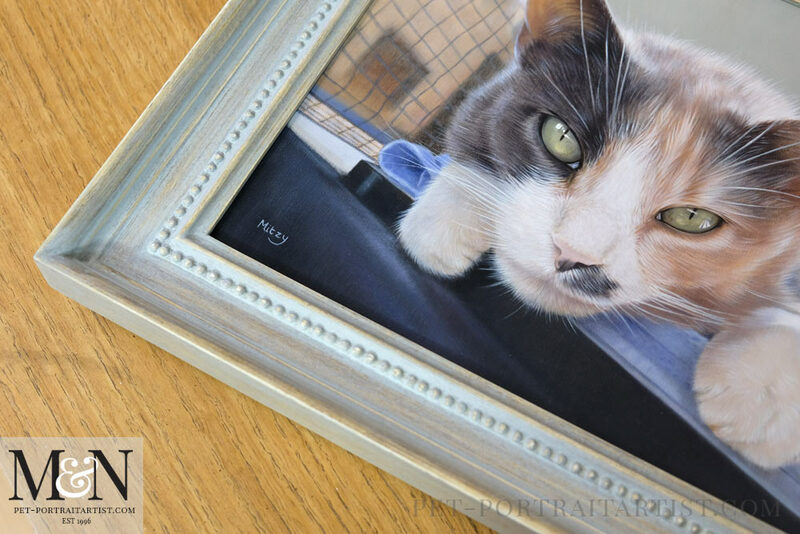 Helen in the UK commissioned an oil painting of their family’s beloved cat called Mitzy. It was to be a surprise present for her husband. Sadly Mitzy has passed away and Helen and her family miss her dearly. Mitzy resembled my grandmothers cat when I was a child who was also called Mitzy! 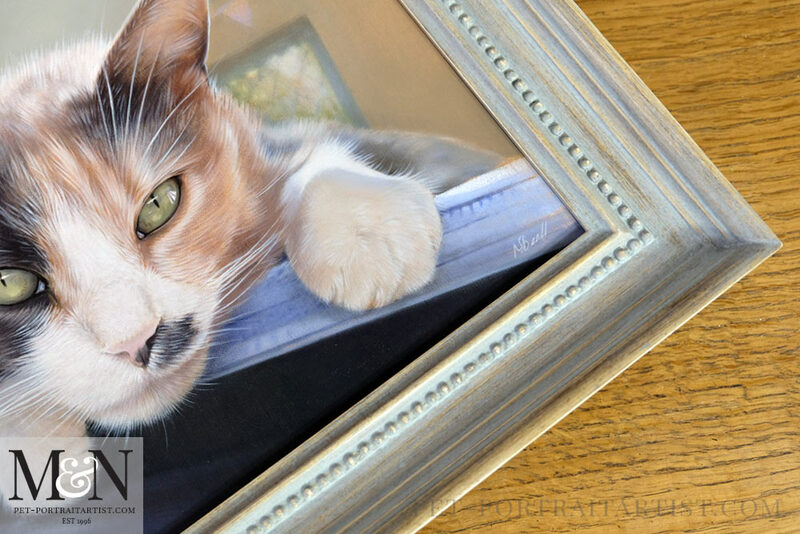 So this was not only a special portrait for Helen, it bought back lovely memories for me of a wonderful cat — and a wonderful grandmother too. 14 x 11 was the perfect size for the cat oil portrtait. Helen asked if Nicholas could paint the photo in its entirety. Mitzy was laying on their table tennis table on a towel. Nicholas painted this, along with the bunting and window behind. It all worked beautifully. Even down to the ceiling colour, which with the lighting in the photo gave it almost a duck egg blue feel. 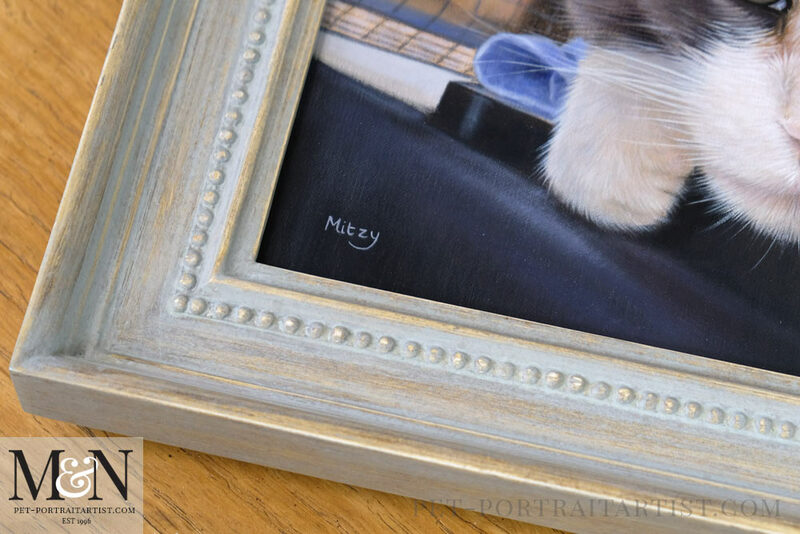 Nicholas incorporated into the painting as it set off Mitzy’s light coloured fur well. You can read an email from Helen below when she saw the final photo of the painting, along with some candid shots which you can see below too. Oh my goodness, what a stunning portrait! I had tears in my eyes at how lifelike it is. 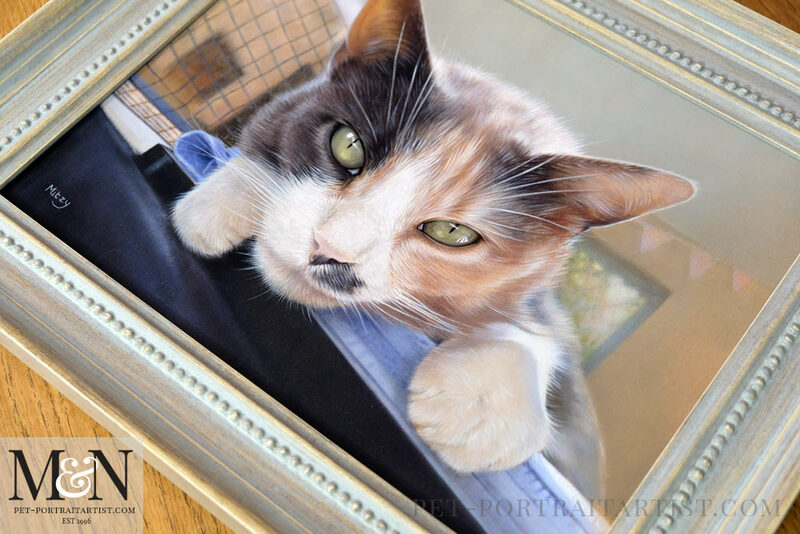 Nicholas is a very talented man and we are so lucky to have had him capture to perfection our wonderful cat! 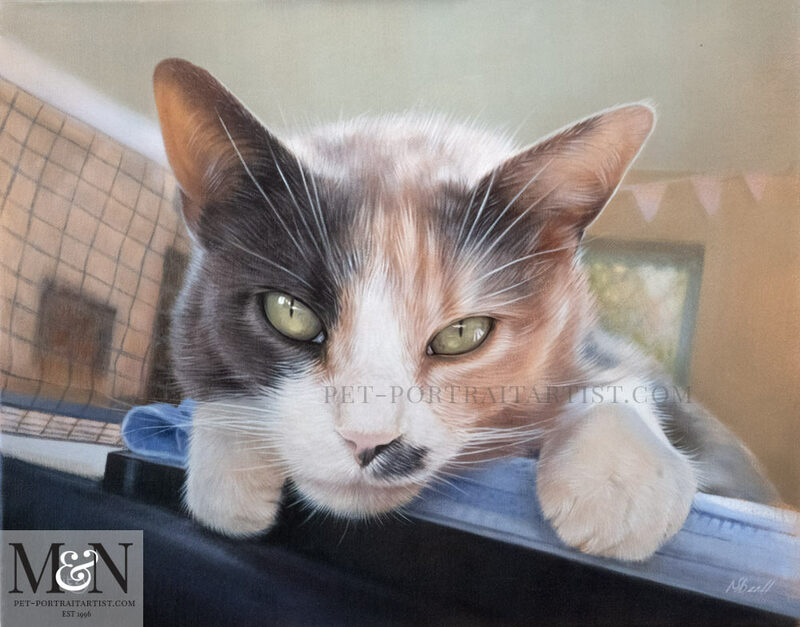 The detail is unbelievable — even the reflection of the windows in Mitzy’s eyes, in fact the more I look at it the more detail I notice and I am in awe! Please pass on our heartfelt thanks for creating this stunning portrait that will be treasured for ever. And thank you too Melanie for the great emails organising the portrait and informing of its progress. Here are a few photos of the portrait taken in the studio showing Nicholas and his paintbrush for scale. 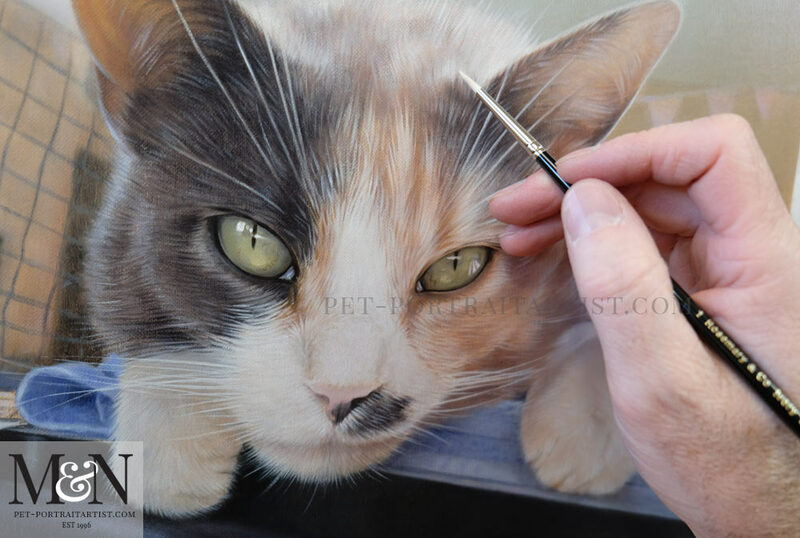 You can see the amazing detail that has gone into Mitzy’s coat and whiskers, you can really feel that she is coming out of the portrait at us. Her eyes are beautiful! Keep scrolling to see photos and video of the frame….! Just a quick email to let you know that Mitzy arrived safely at 8.30 this morning! She looks even more stunning than in the photos and the frame is perfect. I can’t believe we have her here after seeing her only 2 days ago in your studio! Lovely secure packaging as well. 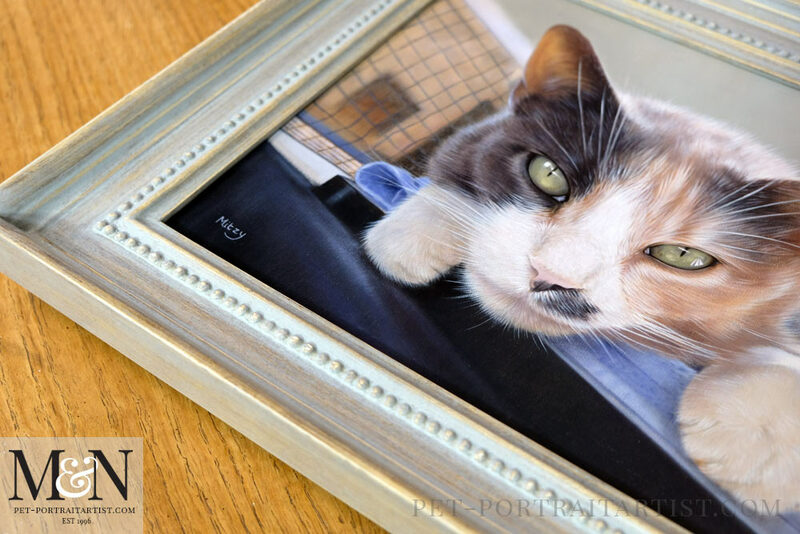 It was very emotional seeing our special cat taking pride of place on your website. It is lovely to see the progression of the portrait from start to finish. I will let you know how Andrew reacts when he opens his present on Christmas Day! I suspect there may be a few tears! All the best to you, Nicholas and Lily. 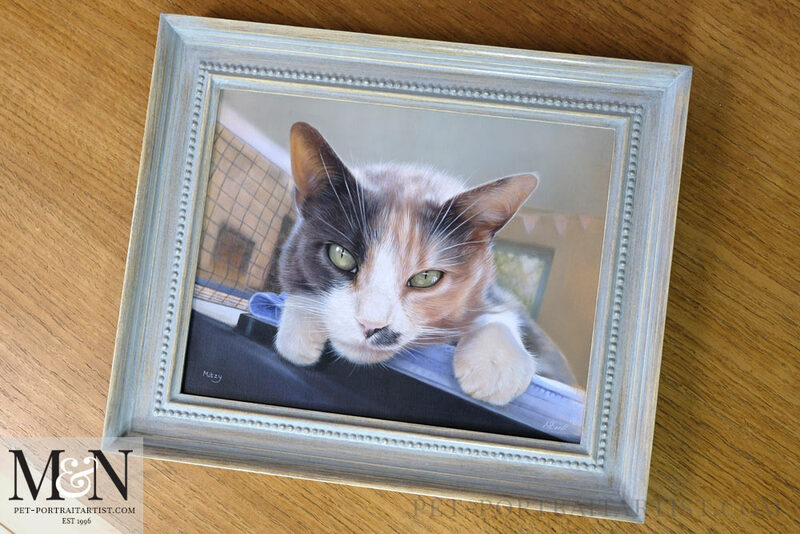 Continuing on from the duck egg blue colour in the cat oil portrait, it amazingly matched with the frame that we all chose too. It’s a new frame which we have not used before called Claremont. We were not absolutely certain of the exact colour when ordering with our framers. However, it could not have worked better! It was the best frame choice, couldn’t have worked out better! We are very much looking forward to hearing what her husband says when he receives the painting. Helen emailed and you can read it below. We are of course delighted and it was so lovely working with Helen too. Absolutely delighted with the frame! It finishes Mitzy’s portrait perfectly. The dot detail just adds something special without over powering it. It was a great choice by all. 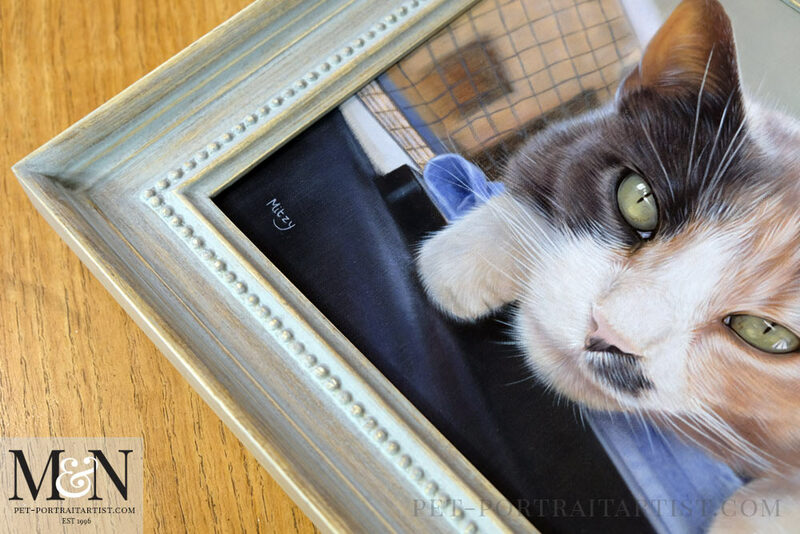 This portrait is a testament of what a special and unique cat she was. I’d like to thank you and Nicholas once again. You are both wonderful and talented people.